September Muller Meta, time to extend my streak to 3 in a row? It was a tough one — just 78 correct answers as I type this 90 minutes before the deadline — but I managed to wrestle it to the ground. 41-A [* U2 classic] — man, these are some sad songs so far! Probably not meta-related, though. Alright, what now? Well I should’ve mentioned that Pete tells us we are looking for a well-known song and that our title is “Externalities.” From that, my first suspicion is that we would be looking for some kind of extensions out of the grid from the theme entries, an idea supported by the fact that all dozen starred entries border the edge of the grid. So far, so good. First idea: can you add a letter outside the grid to make a longer word? DUST becomes dusty, RAIN becomes rainy, but then… STONED doesn’t become anything. So that’s no good. What about putting a word after each of these — or maybe before the ones on the left edge, and then after the ones on the right edge, thereby forming externalities there? Perhaps song titles? Let’s try it. Wait, that Bowie song isn’t called “Stoned Love,” he just sings those words in it. But Google tells me about the last Top-10 hit for the Supremes, which carries that title. So let’s follow this line for a moment, I thought to myself. But “Dust Love” and “Rain Love” aren’t songs I (or Google) know, and neither are “Lush Love” or “Real Love” — wait, “Real Love” is that posthumous John Lennon song they released a while back. So that one does hold. Curious! How about on the other side? “Love tap” and “love affair” are phrases, but not famous songs, as far as I can tell. But it’s interesting that, at the very least, all four of the middle entries can aptly follow/precede the word “love” to make a well-known phrase. Perhaps the grid is divided into threes, and the top and bottom four answers will similarly follow/precede a different word? Certainly a plausible working theory, and the adrenaline started pumping when I found cloud BANK and cloud NINE along the upper left, and then DUST cloud and RAIN cloud along the upper right. This couldn’t be a coincidence, so it remained now to first deduce the keyword for the bottom third of the grid, and then to extract what song all this pointed to. The first task took just a minute or two: the keyword is life, forming lifeLINE and timeLINE along the left edge, and LUSH Life and REAL life on the right. The former was unfamiliar but Google tells me it’s a hit song of this year by an 18-year-old Swede called Zara Larsson. Which points to what song? Nothing jumped out at me, so I threw the search cloud love life lyrics into Google and the first entry, I immediately realized, was our meta answer: Joni Mitchell’s BOTH SIDES, NOW, whose lyrics mention looking at clouds, love, and life from both sides — as in both sides of the crossword grid. I found this several-leaps-required meta amusing. I am somewhat bothered, though, by the fact that some-but-not-all of these phrases are famous songs. “Cloud Nine” is the George Harrison song/album, while “Stoned Love,” “One Love,” and “Lush Life” have been addressed already. But the other’s don’t appear to be song titles, and it’s a bit odd (and I think it will irk some meta solvers) that not all of the twelve phrases are songs but that some are. Might’ve been better if none of the twelve were songs. Interesting mechanism with a nice, winding path the answer. 4.35 stars. This entry was posted in Daily Puzzles and tagged contests, Pete Muller. Bookmark the permalink. 85 correct this month – a few just under the deadline. It turns out all 12 are songs, some way more obscure than others. The rule of thumb I used was that if the song wasn’t pretty well-known, it had to be a familiar phrase. 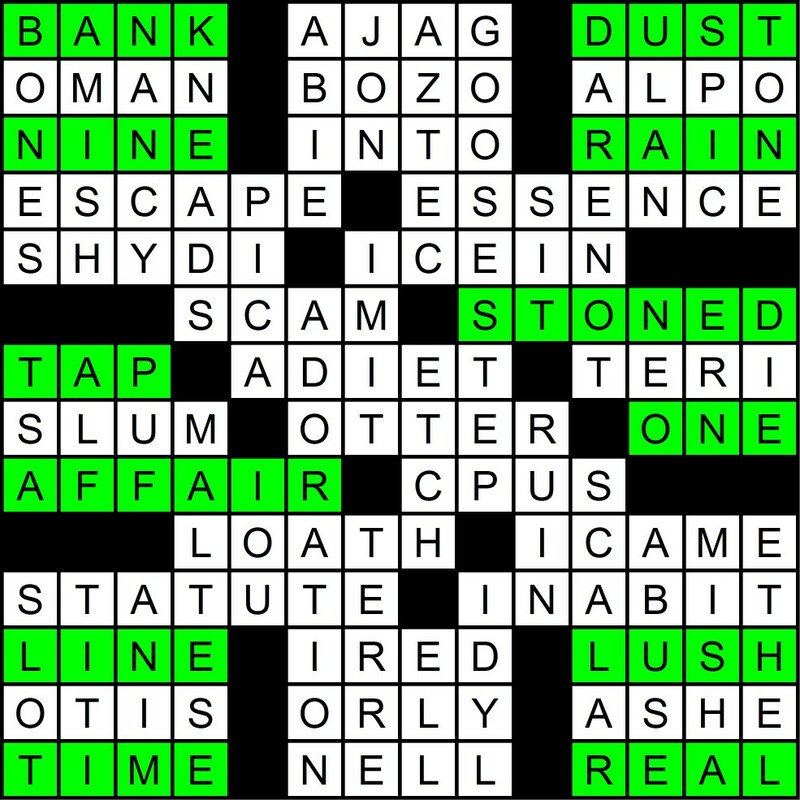 Wow, I totally missed the “jon/imi/tch/ell” in the puzzle too, although did solve the meta after much gnashing of teeth, and was convinced enough of the correctness of the answer by the fact that the additional words were tracked onto “both sides” of the puzzle. But the name would have cemented it unquestionably (and just speaks to Pete’s level of craft). Though many many other artists have recorded the song: I listened to Leonard Nimoy’s version upon solving, in honor of Star Trek’s 50th. I missed that as well. Very nice — who would’ve thought you could hide something in the center of that already-packed grid? Oh my God, I never saw “JON/IMIT/CH/ELL” (on “both sides” of center) either. Brilliant! “Lush Life” is also a jazz standard, possibly Billy Strayhorn’s masterwork. Whoa, JON IMI TCH ELL in the center? That pushes this into Puzzle of the Month territory. I knew that there was something going on exactly as described here, but too many of the grid songs were too obscure for my knowledge and didn’t Google well, so I never finished. I also would not have made the jump to Joni Mitchell either, so this is a good way to break my streak ;). Nice meta, but in a weird way I’m glad that I had the right idea, but could not have figured it out. Too many jumps for me ;). I first encountered “Both Sides Now” about ten years ago. I’m a forty-something and for a week or so I walked around being mad at the generation before me, undeservedly of course but no less vivid, for not making me aware of this song. 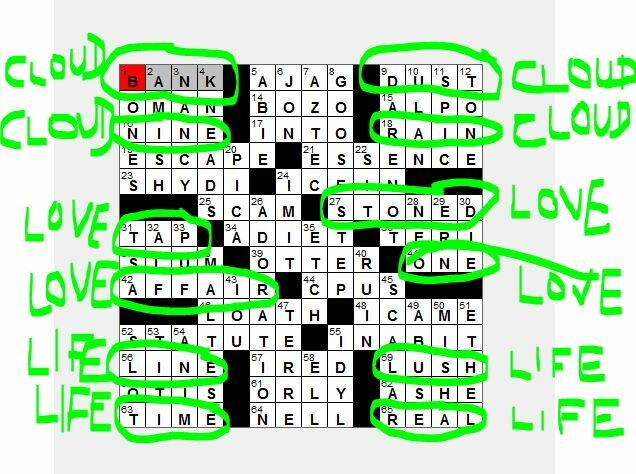 Minor point, but you have “timeLINE” instead of “lifeTIME” in the paragraph just above the grid with all the green writing, which made the explanation confusing for a few seconds (although most fiend readers should be able to figure it out…). Great puzzle and meta. I didn’t get the answer, probably because I’m super-uninformed and had never heard of things like “lush life” and even the answer song. Not a Joni fan, so I guess I never stood a chance. count me as another person who solved it (though I’ve never heard the song) while completely missing the giant JONI MITCHELL down the middle!